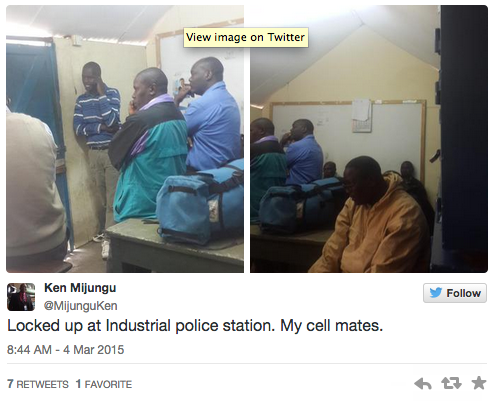 On Tuesday, NTV senior reporter Ken Mijungu was arrested locked up in jail after he wrongfully switched lanes. Mijungu was driving along Mombasa road when he disobeyed the traffic rules and switched lanes, endangering the lives of other motorist. He was taken to Industrial area police station and locked up with other criminals for about 40 minutes until he paid the bail and was released. When he was still locked up he tweeted a photo, waiting for his turn to get out, check it out.